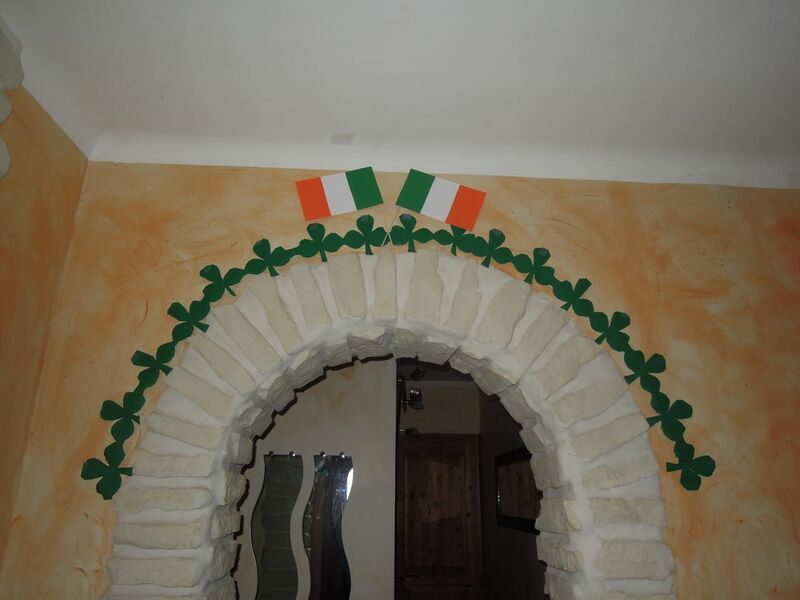 It was St Patrick’s Day (March 17th, in case you didn’t know). We’ve been planning this for months – since our last Movie Night in October. The plan was simple, invite people, ask them all to bring something small to eat and share, provide some sort of wine, show a movie and reserve the right to serve Irish Coffees at the end of the night. 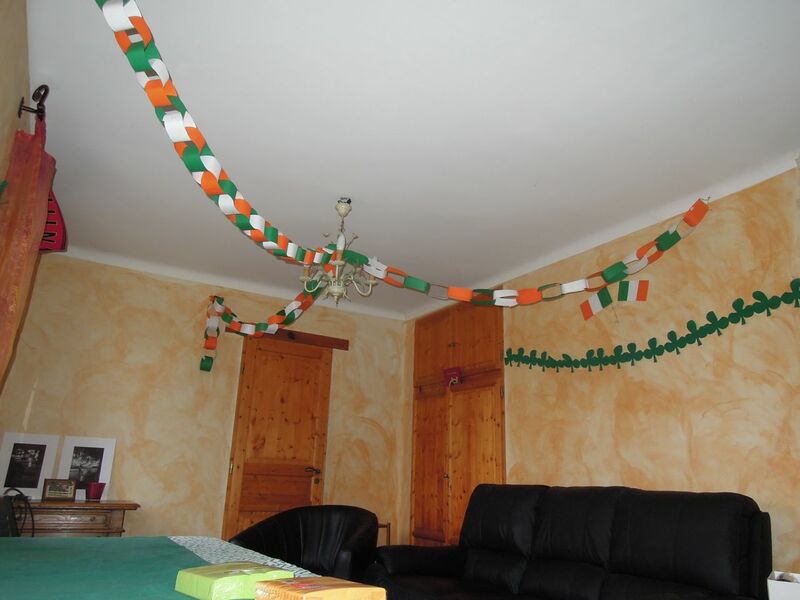 The day before, I revisited my childhood by making paper shamrock chains and paper garlands. It was a lot of fun pretending I was eight years old again… only now I’m allowed to use the stapler and the scissors! Woohoo! 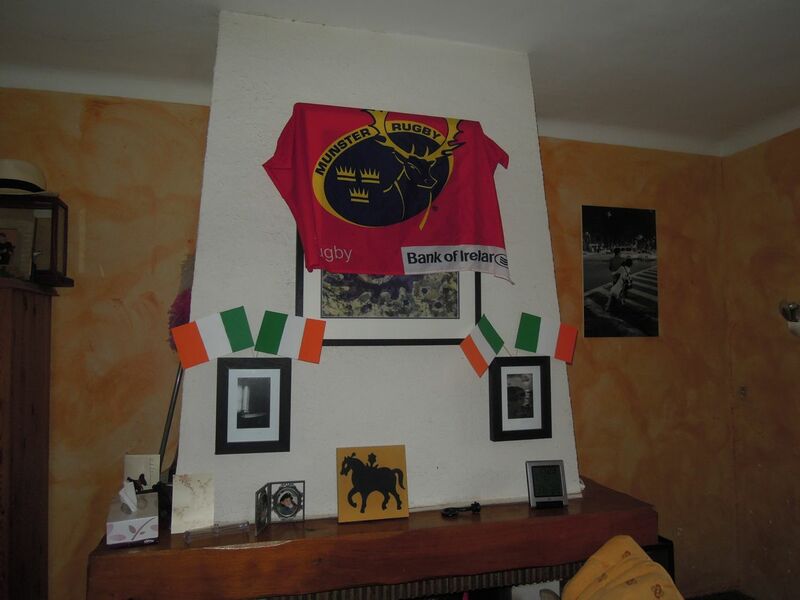 I thought my shamrocks and flags worked out well! And then people started to arrive. 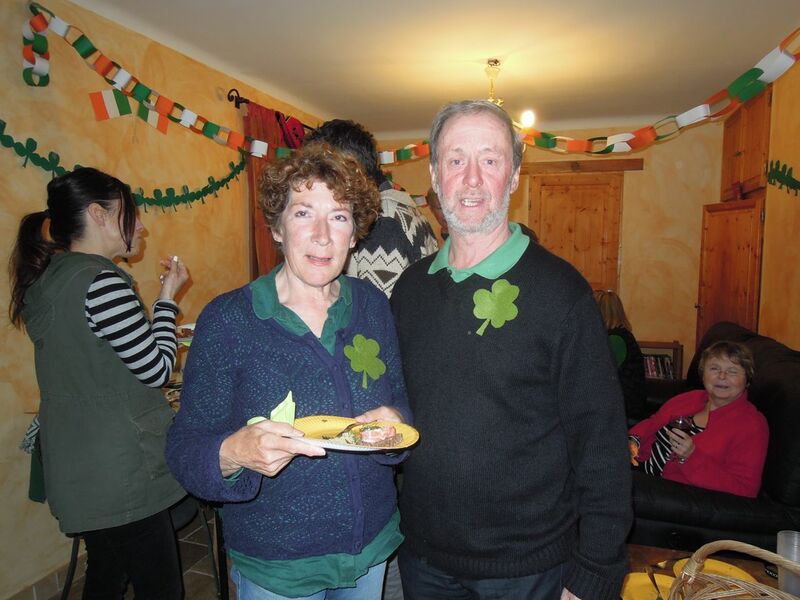 Some of them (well, two of them) had gone all out and made little shamrocks to wear. And our table filled up with food. Lots and lots of food. 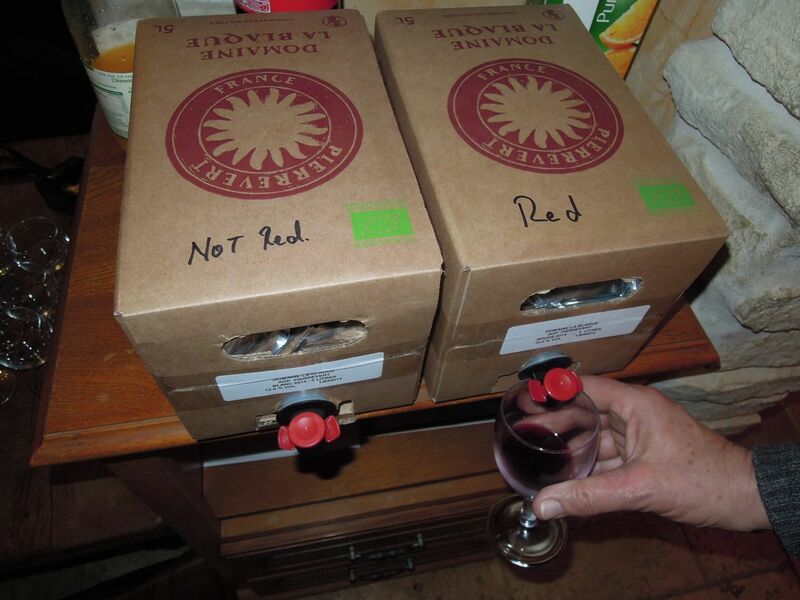 It was almost emptied by the time the evening ended. What was left turned into tonight’s dinner. 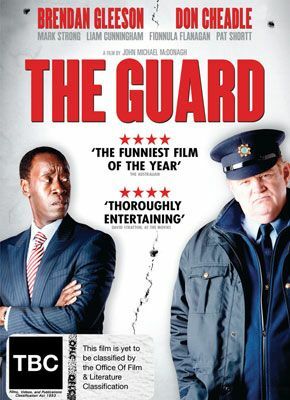 Then, finally, we watched our chosen movie, The Guard, in English with French subtitles. I’d forgotten just how much cursing is in it, but it was interesting to see how clean the French translation was. It didn’t have the same ring, I feel. I think the movie went down well. It’s one I like, and Brendan Gleeson is a great actor. Finally, Irish coffees were drunk. 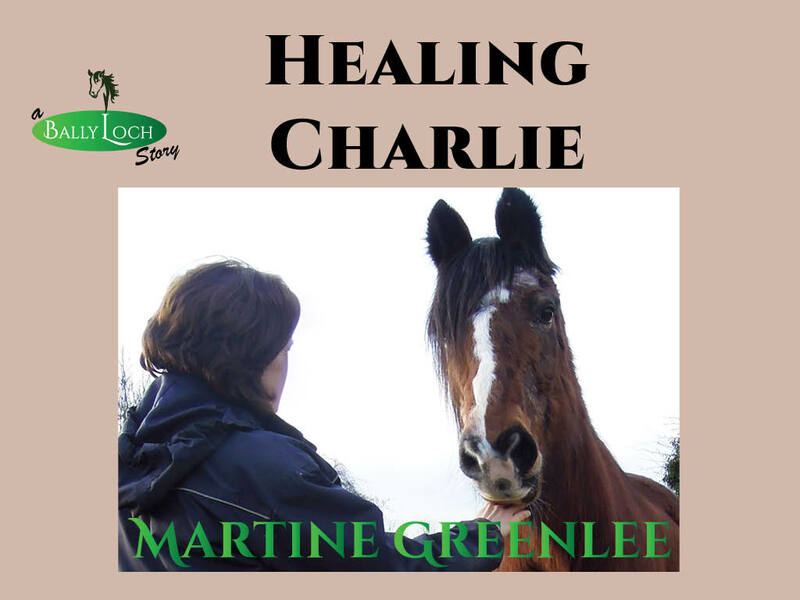 So was Martine, so there are no photos of them. Loved the movie and I must admit I had to rely quite heavily on the subtitles (French subtitles = more comprehensible than Irish-talk). But the f-word was very easy to understand, and that gave me a sense of security. thank you for a truly delightful evening! Looks like a great way to celebrate St. Paddy’s Day! 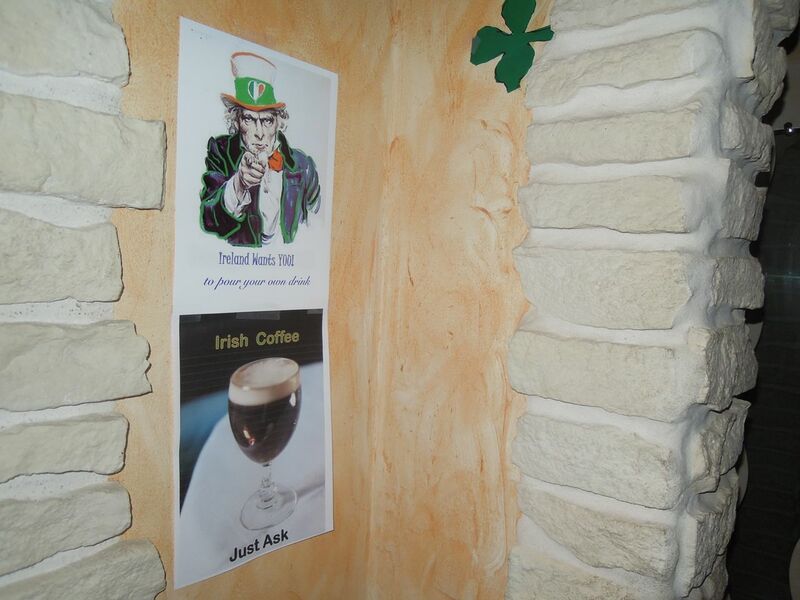 Sorry we missed the movie, but mostly that we missed the Irish coffee. It was a delightful evening. I was lost during the film. 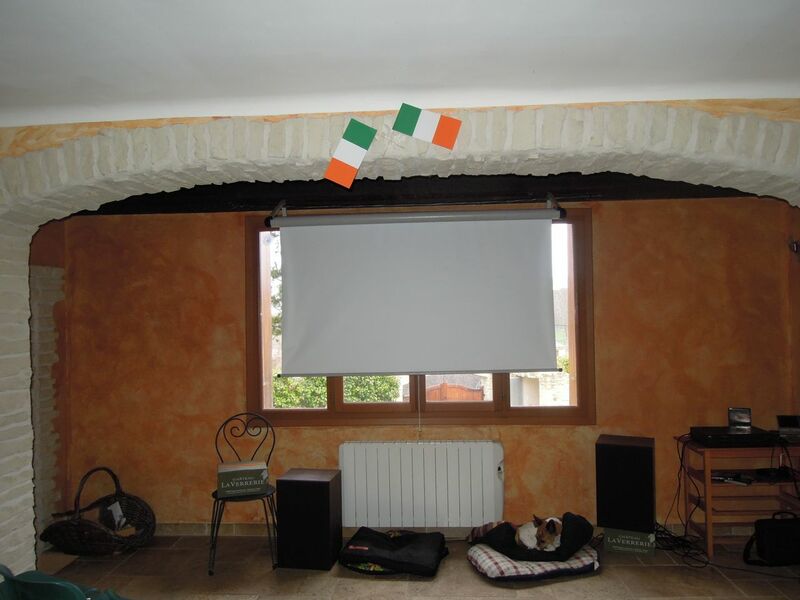 For the life of me I couldn’t understand hardly a word of the Irish twang nor could I understand the French subtitles. 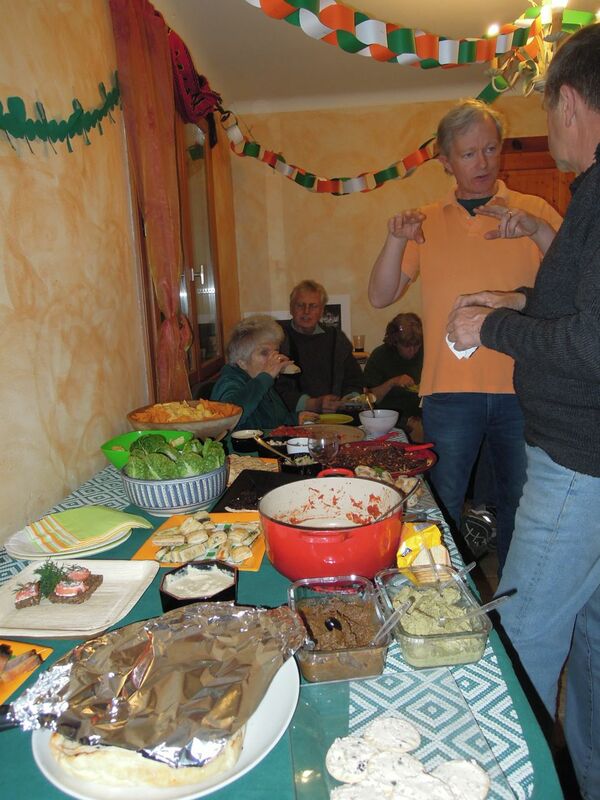 The food was tasty & the guests were delightful. Looking forward to the next movie night. Hopefully a film in English I can understand or English subtitles.